Heat two tablespoons of the oil in a non-stick frying pan that is about 23-25 cm or 9-10 inches in diameter. Add the onion and bacon and sauté for 2-3 minutes, or until it becomes soft and translucent. Dry the thinly sliced potatoes with a clean kitchen towel and add to the pan, tossing to combine. Season generously, reduce the heat and cover with a lid or plate, then cook gently for 20-25 minutes until cooked through and lightly golden. Turn them over once or twice and shake the pan occasionally to ensure that they cook evenly. When the potatoes become translucent and cooked, add the asparagus and cook for a further 2-4 minutes. Break the eggs into a large bowl, add a good pinch of seasoning, then whisk lightly with a fork. When the onion and potato mixture is cooked, drain off any excess oil and quickly stir into the beaten eggs. Wipe out the frying pan and use to heat the remaining tablespoon of olive oil. Tip in the potato and egg mixture, pressing it down gently. Cook for about 5 minutes until there is virtually no raw egg mixture left on top of the frittata, pushing down the sides with a spatula for a curved edge. Invert onto a flat plate and slide the frittata back into the pan. Cook for another 5 minutes until just cooked through, but still very moist in the centre. 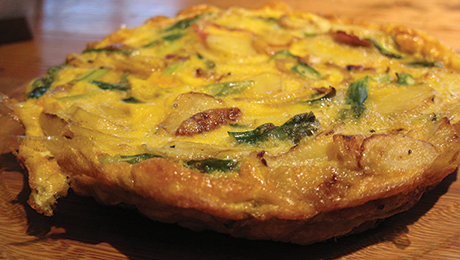 To serve warm or cold, turn the frittata onto a chopping board and cut into wedges. Place a wedge on each serving plate and serve with separate bowls of mixed salad.